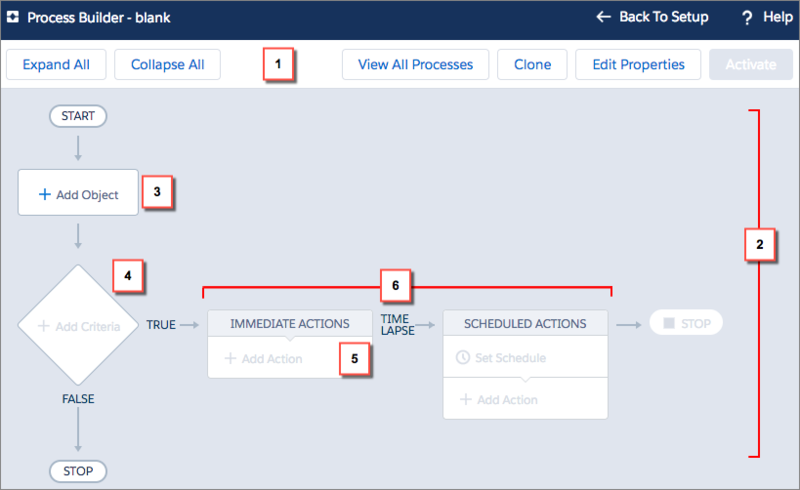 List the types of processes that you can build in Process Builder. Define the key components used to create a process. Build a process that updates the addresses for an account's contacts when the account’s address is updated. Process Builder is a point-and-click tool that lets you easily automate if/then business processes and see a graphical representation of your process as you build. Every process consists of a trigger, at least one criteria node, and at least one action. You can configure immediate actions or schedule actions to be executed at a specific time. Here’s an example of a simple process. The trigger identifies when the process should run. For record change processes, the trigger determines which object and which of the following changes the process should pay attention to. While a process gets one trigger, you can add as many criteria nodes as your heart desires. Each criteria node controls whether or not the process executes the associated actions. If the record doesn’t meet the criteria, the process skips those actions and moves on to the next criteria node in the process. Enter a custom formula. Like in validation rules, the formula must resolve to true or false. Opt out of criteria and always execute the associated actions. When a criteria node evaluates to true, the process executes the associated actions or waits to execute them at a scheduled time. Each immediate action is executed as soon as the criteria evaluates to true. A specific date/time field on the record that started the process. For example, a month before an account's service contract expires. The time that the process ran. For example, 3 days from now. Regardless of when the actions execute, here are some of the things you can do with a process action. Update the record that started the process or any related record. Submit that record for approval. Update one or more related records. Send emails using a specified email template. Post to a Chatter feed. If you need more than what’s available in Process Builder, build an autolaunched flow or an Apex class to fill that gap. Then call the flow or Apex from the process. Process Builder can automate a few kinds of business processes. The main difference is the trigger: when the process starts. To keep things simple, this unit focuses on the most common process type: Record Change. Before you dig into the Process Builder, let’s take a quick tour. The button bar (1) lets you manage the process or view the list of all processes. Here’s a common use case: If an opportunity is created or updated (trigger) and it’s high-value and closed won (criteria), then create a draft contract (immediate action). Six days after the opportunity closes (schedule), create a follow–up task for the account owner (scheduled action). Plan out your business process before you try to automate it. Doing so makes it easier to configure when using one of our automation tools. From Setup, enter Process Builder in the Quick Find box, select Process Builder, and then click New. Name the process Closed Won Opportunities. The API name updates to Closed_Won_Opportunities when you tab out of the Name field. For the description, enter If a high-value opportunity is closed and won, create a draft contract and a follow-up task for the account owner. Configure the process to start when a record changes. 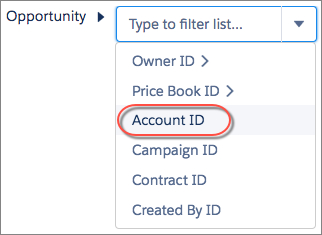 For Object, enter Opp to filter the list of options and select Opportunity. Select when a record is created or edited. Now let’s define the criteria. We check whether the opportunity is closed won and if it’s high-value. In this case, high-value means more than $250,000. Name the criteria Closed Won and High-Value. Leave Conditions are met selected. Check whether the opportunity has been closed and won. For Field (1), choose Opportunity | Stage, and click Choose. For Operator (2), leave Equals selected. For Type (3), leave Picklist selected. For Value (4), select Closed Won. With another condition, check whether the opportunity is high value. For Field (1), choose Opportunity | Amount, and click Choose. For Operator (2), select Greater than. For Type (3), leave Currency selected. For Value (4), enter 250,000. Click Advanced and select Yes. 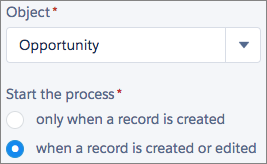 When you select this option, the process ignores record changes that aren’t relevant to your defined criteria. For example, if the opportunity’s description is updated, the process won’t execute the associated actions. Let’s have the owner follow up with the account 6 days after the opportunity closes. Under Scheduled Actions, click Set Schedule. Set the schedule for 6 days after the opportunity closes. Now let’s define the actions that execute when the criteria are met. We need an immediate action that creates a draft contract and a scheduled action that creates a task for the account’s owner. Under Immediate Actions, click Add Action. For the action type, select Create a Record. Name the action Create Draft Contract. For Record Type, select Contract. When you select the object that you want to create a record for, Process Builder displays rows for the required fields. To associate the contract with the opportunity’s account, set Account ID. For Type, select Field Reference. For Value, select Opportunity | Account ID and then click Choose. When you select a value without next to it, you're selecting a field. To use fields on related records, click a value with next to it. Make sure that the new contract is a draft. In the Value for Status, select Draft from the dropdown list. Under the schedule we created earlier (6 Days After Close Date), click Add Action. For Record Type, select Task. Set the task's field values. Success! You’ve created a process that automatically manages your high-value business opportunities. To start using this process, just activate it. You can expand this process to include more criteria and actions. If the first criteria node that you defined doesn’t evaluate to true, the process can then check whether a high-value opportunity is closed and lost, or whether a quote was given, with more actions based on those conditions. The possibilities are endless!